Stop Susan Williams starts out with Chapter II to mimic the concept of stepping into a theater running a weekly series of serials, all of which would be on different chapters of their stories. There is no Chapter I.
Michael Swan, who plays Jack Schoengarth here, will go on to play the "bad cop" at the Visitor roadblock on Kenneth Johnson's mini-series V.
The framed photo Susan accidentally knocks over in her brother Allen's apartment, alerting the intruder to her presence, is a photo of her. When the intruder unintentionally steps on the photo frame of Susan, the glass cracks into a spider-web of shards, symbolizing both the intention of the people behind her brother's disappearance to get her out of the way as well as her own entrance into a web of intrigue. At 4:12 in the episode, we see a ring with a blue stone set in the center on the finger of the man on the phone. This will be a recurring cue throughout the serial to indicate a member of the conspiracy. While trying to justify to her boss, Dispatch newspaper editor Bob Richards, a trip to Morocco to search for leads on her brother's death, Susan rattles off the four cities/countries Allen was in just before he was killed: Tokyo, Japan; Berlin, Germany; Marrakech, Morocco; Rio De Janeiro, Brazil. Susan (and we) will visit these locations over the course of the serial. Susan reveals to us that it was just last night that Allen was killed when she says, "Bobby, you didn't hear his voice when he called last night." Susan also fills us in on the likely reason Allen was killed, saying, "He said he was on the verge of breaking the biggest story anyone ever uncovered. An international conspiracy to reap a vast fortune by an event which would shock the world." After her editor reluctantly agrees to send Susan to Morocco, he tells her to fly coach. The next scene is of a supersonic Concorde airliner taking off! Concorde's were an expensive way to fly, especially in the 1970s when this serial was made. When Susan arrives in Marrakech and meets with Jack Schoengarth, she tells him Allen was killed four days ago. Allowing her a day of travel, she waited three days to get on a plane to Morocco? I guess she had to wait until there was a Concorde available! I suppose she might have stayed home to attend a memorial service for her brother but, convinced as she is that he was murdered and that his address book could lead her to the culprits, you'd think she'd take off immediately. Jack tells Susan that he first met Allen in Algiers "during the fighting", where he (Jack) had fought for both sides at different times, whoever paid him more. I'm not sure what fighting he is referring to. The War of Algeria for freedom from French rule had ended in 1962 with Algerian freedom and Jack doesn't seem old enough to have participated. While speaking to Jack, Susan reveals Allen was killed in a hit and run. At the cliffhanger ending of this week's episode, as the cobra strikes at Susan in her bath and the scene wipes to a shot of the market at Marrakech, you can hear the sound of a gunshot! This would seem to be a tipoff to the resolution of the cliffhanger at the beginning of Chapter III which shows Jack arriving just in time to shoot the snake as it strikes, saving Susan's life. As the ending voiceover tantalizes the viewer to learn more of the story in next week's chapter, we get a shot of Jack from 14:07-14:11. The same 1.5 second scene of him is run forward and backward a few times to fill the 5 seconds, as evidenced by the gyrating hips and tassels of the dancing girl in the background! The introductory voiceover tells us that U.S. Marshall Jim Donner is investigating stolen gold shipments in 1880 Wyoming. The western town is Cheyenne, Wyoming, as revealed by Marshal Donner in his conversation with Millie Thompson. The conversation also reveals that this is his first assignment as a Marshal. When young Billie runs into the doctor's office to tell Donner he's seen the Phantom Riders, he says it happened while he was hunting jackrabbits out at Vasquez Rocks. There is no place by that name near Cheyenne, but it's obviously a reference to the southern California location where many of the serial's outdoor scenes were filmed! Vasquez Rocks, well-known as a site for shooting television, movies, and commercials, is probably best known as the location of Captain Kirk's fight with the reptilian Gorn in the "Arena" episode of the original Star Trek. 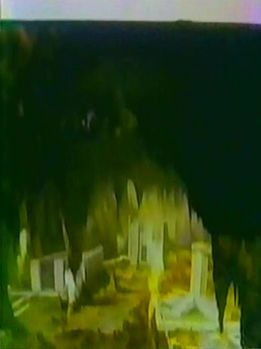 At 24:18 in the episode, as Donner looks out through the glass of the elevator at the underground city below, we get a glimpse of the top edge of the matte painting used to depict the city! It is convenient that (in typical Hollywood sci-fi fashion) the citizens of this secret civilization just happen to speak English so Donner can understand everything said! The security personnel in the underground city are called Shadow Guards. Donner uses a whip he just happened to be carrying to trip up one of the Shadow Guards and rescue the princess. Why was he carrying a whip? It may have been inspired by Lash La Rue, a star of 1940's-50's B-movie westerns known for using a whip; his first role was as the Cheyenne Kid, brandishing a whip as a weapon! The cliffhanger ending this week: Donner has been shot by one the shadow guards' strange handguns, falls from a balcony and lands in a comatose state with a white frost or coating covering his body. Is this the end of Marshal Jim Donner? 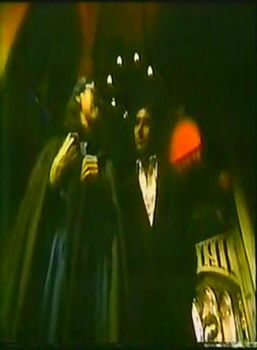 At the beginning of this chapter, it is not clear (at least in my low quality video copy) how Dracula is able to start the fire in which he attempts to trap and kill Kurt Van Helsing and Mary Gibbons. Does he throw a gas lamp down at them? Or does he have the ability to generate and hurl a ball of fire from his hands? As the fire spreads, Mary says, "Kurt, it's gasoline!" But is she referring to gasoline having been poured around the barn ahead of time as part of a trap or does she mean that Dracula has thrown down a Molotov cocktail? A shot of the Golden Gate Bridge tells us the story takes place in San Francisco. Mary says that Dracula brought 20 coffins of his native soil to the U.S. that they know of and she and Kurt have destroyed 13 of them. She also says Kurt's grandfather would be proud of them. Presumably said grandfather is Professor Abraham Van Helsing, the character in the original Bram Stoker novel Dracula, who leads the group that hunts and (seemingly) destroys him. From the conversation between Kurt and Mary at the university, we learn that Kurt is using the university's computer to track down leads on Dracula and his hideouts. Dracula has taken a job teaching night courses in Eastern European History at South Bay College. Since he has lived through 500 years of European history, it's an appropriate job! The night course also allows him to take advantage of his mandatory night time existence. Although there are a few colleges going by the name South Bay College, there does not appear to be a real one in the San Francisco area. As we enter Dracula's classroom, he's speaking somewhat uncharitably about Princess Stephanie of Belgium, implying that he'd met her. She was a real person (1864-1945), wife of Crown Prince Rudolf of Austria-Hungary and generally considered (like Dracula's description of her) to be rather conservative, boring, and plain. After his class lets out for the evening, Dracula identifies a constellation in the sky for one of his students: Cygnus, the swan. Mary, who has attended the class in disguise, comments that Cygnus is also known as the Northern Cross. Dracula responds that he prefers to think of it as a swan. Of course, crosses are anathema to him as a vampire! 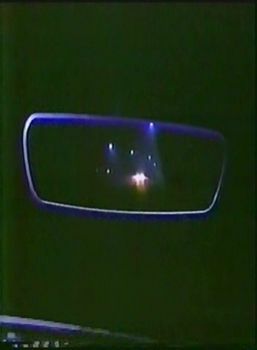 As Dracula drives a few of his students to his home for some after class discussion, notice that as he watches Kurt's car following him in the rearview mirror, he casts no reflection. Also the mirror appears to be upside down! Dracula confides in Mary that he misses the sun, not having seen it for 512 years. Going back through the scenes of the interior of his mansion, it seems as if Dracula may have placed ersatz suns as lights within. 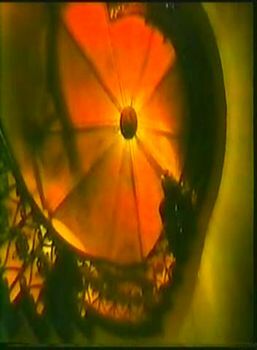 Notice the sun-like orb at 39:57 in the episode and the "rays" of lighting above the spiral staircase at 45:52. In the scene at 47:23-47:24 in the episode, as Kurt's car has flames spewing from under the hood, a cable or something can be seen dragging behind the vehicle. Perhaps it is an electrical cable rigged to blow the special effect explosive that destroys it? The cliffhanger ending this week: a double-cliffhanger! Dracula is about to put the bite on Mary and Kurt's car has just exploded due to a cut fuel line!